Spencer Krug’s Sunset Rubdown are playing the Music Hall of Williamsburg tonight with Johnny and The Moon (fellow Wolf Parader Dante DeCaro’s band) and Montreal psych pop ensemble, Magic Weapon. Now this might be the first time Magic Weapon has played NYC, but I’m not 100% sure. 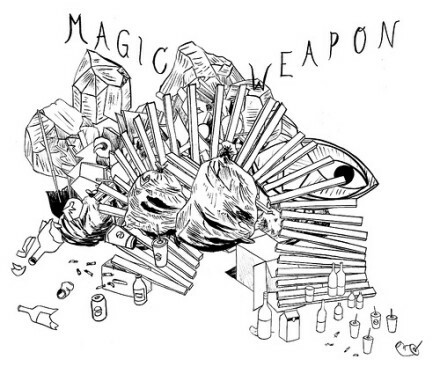 For the uninitiated in the incestuous world of Montreal pop, Magic Weapon is made up of members of Sunset Rubdown, Think About Life, Miracle Fortress and Shapes and Sizes and it was through them that I first found out about the aforementioned Miracle Fortress. Magic Weapon’s new EP Residue Hymns is available on tour as of October 7th. If you can’t make it to MHOW tonight, the same lineup plays tomorrrow night at the Bowery Ballroom. It will also be available for purchase in Montreal stores, mail-order, and, finally, PAYPAL, sometime in early November. PS Sunset Rubdown’s new record, Random Spirit Lover just received a lofty 8.5 from Pitchfork.